Amongst other things, Friedman said that we are at the end of the post-Cold War world. After 1991 it stood on three pillars, the United States (as the only really global power), Europe (promising to emerge as the United States of Europe) and China (a low-wage country growing at a phenomenal rate). According to Friedman, this world ended in 2008, when Russia ‘came back to history’ on 8 August of that year and when Lehman Brothers collapsed on 15 September, which left the world at a point where we literary think what the future holds, while the new order is yet to be defined. Friedman concluded by saying that it is clear to Americans that this new (cold) war (backed by two congressional documents) will be waged on the Black sea, because of the Crimea and because of the pipelines. He added that the US generally does not intervene overseas without allies with ‘substantial skin in the game’. Friedman said the US expects massive shifts in the way in which its three main potential regional allies, in Washington’s struggle with Moscow, would behave. These are Poland, Romania and Turkey . Friedman described these three as ‘allies from hell’, unreliable for one reason or the other. It seems so far that time has proven his expectations concerning the allies, especially in case of Turkey. However, just behind the buffer zone of the American allies that Friedman drew on a map, countries of another, pro-Russian buffer zone (conditionally speaking), are being glued by fear and interest. Fear for their security, in the undefined new world order currently in the making, and interest, in that they may gain better economic and geopolitical starting positions in the future, if they play the right cards. A potential pipeline is connecting this zone, initially called South Stream, but having been cancelled and replaced—maybe only rebranded—now called the ‘Turkish Stream’. Countries in this ‘buffer zone’ to be, comprise—from south to north—Greece, Macedonia, Serbia, and Hungary, and potentially Slovakia, Austria, Italy and maybe even Germany. These would be connected not only by gas, but also by the new Chinese railway, that is intended to connect Budapest and Piraeus via Belgrade and Skopje. The game changer for Friedman was Turkey’s decision to make a long-term energy deal with Russia’s Gazprom, just after Bulgaria decided to abandon the South Stream, under immense US and EU pressure. This meant that Friedman was right about Turkey’s unreliability, but also that all the stereotypes concerning Turkey, and its role in NATO, require rethinking. In effect, by making this move, and signing the gas deal, Recep Tayyip Erdoğan’s Turkey joined the “pro-Russian” buffer zone, at least for the time being. However, this possible Turkish-Russian gas alliance has many weaknesses, that US is well aware of. Probably because we all have maps, Friedman might add. Turkey has a special relation with both the predominantly Muslim Albanians in the Balkans, as well as with other Muslim populations of the Balkan Peninsula. This means that if any of the Balkan’s predominantly Orthodox Christian countries (i.e. Greece, Macedonia, Serbia, Bulgaria etc. ), for one reason or the other, finds itself in conflict with Albanians or other Balkan Muslim, the gas deal would be jeopardized, and the prospect of a full blown war with Turkey would not be unlikely. If nothing else, Turkish public opinion might pressure the Turkish government to take action, in the event of a Christian-Muslim, or Christian-Albanian, conflict. Turks might also get ‘offended’ any time they please for other reasons. That might occur as a result of the Russian stance on the Armenian genocide and Nagorno-Karabakh, or because of Russia’s policy on Syria and other parts of the Middle East . Any of the factors mentioned could potentially jeopardize the gas-geopolitics equilibrium in the region. However, in a sense, these are nothing but war games around ‘virtual’ infrastructure projects, given that no one can really tell if and/or when they might finalised. In reality, none of these projects are likely to come around before a ‘new order’ in Europe is built, or at least before the zones of interests are defined. Nevertheless, no matter how ‘virtual’ these matters are, power struggle over these potential railways and pipelines (be it South/Turkish Stream on one hand, or Nabuco, TAP or Eastring on the other) define the present and future conflicts in the Balkans and beyond. In that respect, US State Secretary John Kerry reminded us all how fragile these deals are, as is the peace in the region. In February 2015 he mentioned ‘countries on the line of fire’ between Washington and Moscow: “When it comes to Serbia, Kossovo, Montenegro, Macedonia and others – Georgia, Moldova, Transdnistria – they are in the line of fire”. 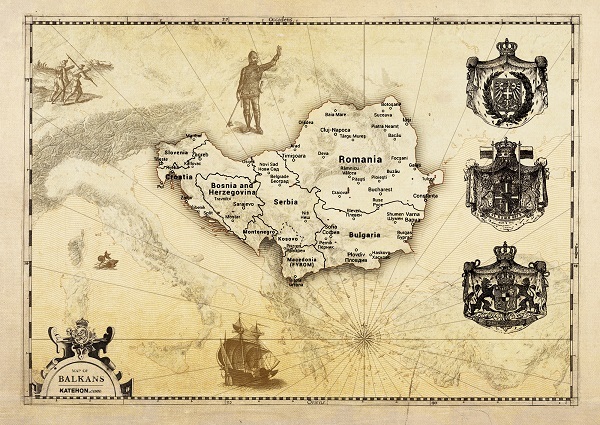 A glance over the map of the Balkans after the break-up of Yugoslavia shows particles of broken glass: “banana republics” or—to be more politically correct—countries, state-like formations and territories under some kind of foreign protectorate. They are all economically unsustainable and in a constant state of political and geopolitical insecurity. Each and every case is unique, but all of them are weak, although unequally weak, which needless to say, only makes Kerry’s warning (or threat, depending on your viewpoint) even more serious. The top three factors that could destabilize the region in the nearest future are Bosnia-Herzegovina, (Greater) Albania and Macedonia. Bosnia-Herzegovina is an evidently instable part of the Balkans. Everyone was reminded of this after a young Wahhabi murdered a Republika Srpska police officer in the town of Zvornik. Indications are that the attacker was connected to the Bosnian branch of the so-called Islamic State (IS). It is widely known that, the Salafist NGOs, from the Persian Gulf, absolutist monarchies, are ruled by families belonging to the Wahhabi sect of Sunni Islam. The Wahhabi presence in Bosnia is a residue of the 1990s civil war, which brought mujahedeen from all over the world to the aid of the Bosnian Muslim leadership. The extreme ideology brought by those fighters stayed in Bosnia-Herzegovina, even after most of them had left. New waves of migration from the Middle East might also bring people connected to the IS to the region, who could potentially add fuel to the fire. The destabilisation of the ‘Serb factor’ might be a viable option for the US in order to discipline its vassals in the region, Serbia above all others . The President of Republika Srpska, Milorad Dodik, has been on very bad terms with the US for a while. In addition to his firm position on defending Serbian interests, he is firmly against the EU sanctions imposed on Russia and supported Russia’s policy on the Crimea in March 2014. Dodik also sees the Crimean referendum as a model for a potential referendum for the Republika Srpska to leave the State, in which it currently resides, a state which a great majority of its population does not wish to belong to. For these reasons he is under constant political pressure from both the Muslim political leadership in Sarajevo and from the ‘international community’, a euphemism for the US and EU. Dodik was also under the pressure during the last parliamentary and presidential elections in Republika Srpska, due to his very bad relations with the Opposition in the Republic, which allegedly has foreign backing. Prior to this, in February and March 2014, there was an attempted ‘orange revolution’ across the whole of Bosnia-Herzegovina, which failed miserably, especially in the Serbian part of the divided country. However, another wave of diplomatic and political attacks on Republika Srpska will probably come in July of 2015, on the 20th anniversary of the fall of the Bosnian Muslim enclave of Srebrenica in 1995, at the end of the civil war in the country. The geopolitical role of Albania and the ‘Albanian factor’ in the region did not change so much from the time before the founding of the country in 1912. Italy and the Austro-Hungarian Empire used Albanians to weaken Orthodox Christian countries, in particular Serbia and Greece. The unsuccessful 1908 uprising of Albanian brigand Isa Boletini, in the territory of today’s Macedonia (which was still part of the Ottoman Empire at the time) was backed by Vienna. The aim was to connect Bosnia-Herzegovina (under Austro-Hungarian protectorate after the Berlin Congress of 1878) with the port of Salonika, which would be a significant gain for the ‘black-yellow monarchy’. The Empire illegally annexed Bosnia-Herzegovina the same year, nearly provoking a war with Serbia and started World War I, six years before it actually started. Today’s support for Albanian expansionism dates from the wars of Yugoslav succession, but it has intensified since the collapse of Albanian’s private ‘pyramid scheme banks’ in 1997. The collapse led to complete chaos in the country, and resulted in breakdown of the Albanian army in the north of the country. Mobs broke into the army barracks and some half a million pieces of infantry weaponry ended up in the hands of ethnic Albanians in the neighbouring Serbian province of Kossovo-Metochia, on the other side of the border. After that came the Albanian insurgency in Kossovo and the NATO bombing of Federal Republic of Yugoslavia. The US never conducted an investigation into their citizens’ participation in an armed insurgency against another nation, most of whom were part of the so-called ‘Atlantic Brigade’. This was followed by smaller Albanian uprisings in Macedonia and in three municipalities in southeast Serbia in 2001, after which a period of relative calm followed, (if we do not include the massive Kossovo-Metochia ‘pogrom’ of 17 March 2004, inflicted on Serbs and their cultural heritage). In 2006 a group of 14 ethnic Albanian terrorists, who were preparing attacks, were arrested by Montenegrin police, in an anti-terrorist operation code-named Eagle’s Flight. Following this, in 2008, the ethnic Albanian political leadership in the occupied Serbian province of Kossovo-Metochia declared independence from Serbia, this declaration was immediately supported by the US, Turkey, Wahhabi monarchies and most EU countries. The 100th anniversary of the founding of Albania (Albanian Flag Day) in November 2012 in Tirana brought about an eruption of Albanian national pride. Around that time Albania’s then-PM Sali Berisha came to Skopje, to announce in exaltation in front of some 10,000 Macedonia’s ethnic Albanians that: “we are going to realise the project of Albanian national unity through the EU”. On another occasion, in front of a crowd in Avlona, in Albania, he referred to the proclamation of 28 November 1912 of“the independence of Albania, the independence of ethnic Albania, of the Albania of all Albanian territories from Preveza [Greece] to Preševo [Serbia], from Skopje [Macedonia] to Podgorica [Montenegro].” Berisha thereby directly provoked all the countries surrounding Albania, by claiming their territories. His rival, the current Albanian PM Edi Rama, constantly echoes these kind of statements, but attracts no criticism from US or EU for doing so. In spite of these foreign and internally provoked nationalist outbursts, Albanians are constantly migrating from the Balkans for a variety of reasons, mostly economic. Some reports estimate that up to 120,000 ethnic Albanians left Kossovo-Metohija within the last five or six months . When thinking of this problem, one should also bear in mind another, less obvious, process. Greater Albania might be a common denominator, if not the only one, for an Albanian nation which has a rising, and probably inevitable, conflict within itself. This conflict would be between the traditional Bekteshi Muslims and the growing Wahhabi community, from which group many have volunteered and fought in the ranks of the IS in Syria and Iraq. This conflict has a social component to it as well. Political leadership and drug lords, as well as traditional clans behind them, belong to traditional Bekteshi Sufi sect, whereas a certain portion of the ‘impoverished masses’ are inclining towards the radical Salafi-Wahhabi sect of Sunni Islam. The influence of Saudi money should be considered in this process. These people are influenced by, (for Albanians) a totally new and essentially ‘internationalist’ religious ideology, one that undermines the nationalism that used to glue all Albanians together, regardless of religion, region or clan. Nevertheless, for the time being the Albanian factor can still be used by the US to provoke instability in all the countries surrounding it, including Greece (a NATO and EU member). This fact is of increasing importance now that global tensions are becoming apparent between the US, on one side, and Russia and China on the other, especially given that all three sides have solid interests in the Balkans. The Macedonian PM, Nikola Gruevski, recently became an unreliable partner of the US. This was most probably because he agreed to participate both in Gazprom’s Turkish Stream pipeline and in the Chinese railways project that should connect Budapest and Athens trough Belgrade and Skopje. The Chinese are particularly interested in this railway because they have bought the largest cargo terminal in the Greek harbour of Piraeus, which would make a railway from there to the heart of central Europe important for them. China’s PM, Li Keqiang, sees Macedonia’s northern neighbour Serbia as a place where the coordination centre for this future railroad would be stationed. At the same time Russia sees Serbia as a crossroad and its key partner for a gas pipeline, but both projects are dead if Macedonia is not committed to them. The terrorist attack on Macedonian border guards on Macedonia-Serbia border on April 21st 2015 was a clear signal to Gruevski government. A further terrorist attack on 9 May, in the town of Kumanovo, was much more serious. The fight left eight Macedonian special police dead and 37 wounded, while 10 attackers were officially confirmed dead and even more arrested by Macedonian security services. This attack symbolically occurred during the Victory Day parade in Moscow, where Macedonian President Djordje Ivanov was present. The opposition in Macedonia, openly backed by western embassies in Skopje, immediately accused Gruevski of ‘provoking ethnic tensions’ to stay in power. No matter how illogical that might sound, this wild conspiracy theory has roots in the recent political past of the country. The whole crisis started several months back when Gruevski played a video at a press conference, of opposition leader Zoran Zaev trying to blackmail him in his own office. The video showed Zaev saying that he has compromising wire-tapped phone conversations that he obtained from a foreign secret service which he did not name. These tapes contained compromising conversations of Gruevski and of his closest ministers. The media spin put the spotlight on the actual conversations and not on Zaev, who openly admits he received them from a foreign intelligence service. For weeks prior to the terrorist attack in Kumanovo, Zaev publicised these conversations, one at a time. After each of these ‘bombs’—as Zaev named the tapes—came a new accusation regarding Gruevski and his cabinet. Then came the terrorist attack in Kumanovo. Not long after the attack, Zaev announced a huge opposition rally in Skopje where he would demand the immediate resignation of the democratically elected PM. Large portions of Macedonia’s ethnic Albanians, as well as pro-western NGOs, support the opposition. It is interesting that the opposition was not demanding early elections—presumably as they were aware they would not be able to win—but rather demanded the PM’s resignation or nothing - a ‘take it or leave it’ offer. The lack of democratic procedure in the demands made by Zaev and his supporters did not seem to bother western embassies. After the opposition rally on 17 May was over, the opposition formed a Kiev-style camp in front of the government building. However, the following day PM rallied his supporters, in a rally that significantly outnumbered the, also quite massive, opposition rally. The result was that Gruevski was victorious for the time being, but the game continues. An interesting phenomenon occurred at the two rallies, in terms of symbols used by the various factions. Besides the Macedonian flag, the second flag dominating the opposition rally was the Albanian one, as most of the Albanian population in this ethnically deeply divided society supports the opposition. At the same time the flag that stood out on the pro-governmental rally was the Serbian one, as the majority of the Serbs in Macedonia support Gruevski in resisting ethnically motivated ‘Albanian’ terrorism and foreign-backed attempts to secure an ‘orange revolution’. It was obvious that in those two rallies, behind the more prominent Macedonian flag, two other flags were in a symbolical struggle – the Albanian flag at the opposition protest and Serbian flag at the pro-governmental rally. Geopolitically speaking, on the ‘chessboard’ of Macedonian, the Albanian flag represented the sea, or Atlantic (US) side, while the Serbian flag represented the land, or Eurasian (Russian) side of today’s global divide. Another interesting factor was the somewhat unexpected reaction of officials in Sofia. The Bulgarian PM, Boiko Borisov, rushed to give a hectic and undiplomatic statement that his Macedonian counterpart should leave; in a similar manner Erdoğan had, only a couple of years previously, suggested to Syria’s President Baashar Assad that he too should leave. After this diplomatic incident, Bulgaria went further by deploying its army to the border with Macedonia. The explanation for this move was that the army was sent to assist the possible flow of Bulgarian national refugees, if the situation in Macedonia deteriorates. This looked as a threat of possible Bulgarian aggression, which analyst Andrew Korybko has suggested bore similarities to actions taken in the Second Balkan War, in 1913, World War I, in 1915, and World War II, in 1941. In light of this, it should be mentioned that just months before the crisis started in Macedonia, a minor pro-Bulgarian party, led by the former PM Ljubcho Georgievski, launched a campaign with billboards stating: “Stop the Serbisation of the Macedonian nation”. These were removed after representatives of the Serbian community protested. Nevertheless, in light of what Friedman said regarding Bulgaria, one might wonder what the US State Department’s intentions regarding Bulgaria are, in relation to the on-going crisis. Friedman said: “Here in Serbia, it is an interesting question what happens to you. You will get caught up in it in some way or another, no matter if others pull you in or if you pull yourselves in, one way or the other, you will get involved. To you the question is Bulgaria […] and very frankly strategically the United States has written Bulgaria off […] what happens to Bulgaria happens […] the American State Department doesn’t think that fast, the CIA may, but they don’t have power over this, but the considerations are already there, and besides we already have maps.” One wonders what this laconic riddle was supposed to mean? Perhaps Borisov’s decision to deploy army on Macedonian border gave a partial answer to that question. So what might the two powers do in future of the region? If Russia wishes to effectively enter Europe, by creating its own buffer zone, which would be cringed behind the buffer zone of the US allies, they have to do it via the Balkans. The only way to do this would be to support the Serbs, as the largest nation in the centre of the Balkan Peninsula and a country where population is predominantly pro-Russian. History tells us that in moments of absolute crises (such as world wars), Serbs have always chosen Russia. The West is well aware of this, and it seems Moscow is also starting to be. The only question is how much time it would take Russia to become involved successfully. Another issue would be the strengthening and widening of the Russian buffer zone. The most reliable partners here should be Serbia and Greece. In his famous book Strategic Depth, Turkish Foreign Minister Ahmet Davutoğlu identified these two countries as the only real obstacle to Turkey’s neo-Ottoman march back into the Balkan Peninsula.